I have been in the look out for a perfect giveaways that would fit the beneficiaries at the same time my budget (most important). But with the current problems and pressure I have in the business, I dont have the energy and nerves to go to Divisoria to source for prizes and giveaways. I just relied in Facebook and Multiply suppliers with a few visits too at Girltalk and Femalenetwork. Luckily I found in Facebook Handicrafts Atbp and right there and then, I made up my mind! I tried inquiring and she responded right away. After a few exchange of messages, we finally agreed and bingo.. 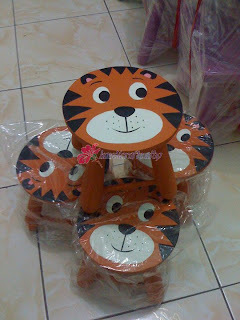 I booked 42 pcs of kiddie stools, paid 70% as downpayment. Now I will just wait for the day when to pick up the giveaways. Its a big relief. Below is the sample of the kiddie stools. I must admit I like this theme (Animal Safari or something) better but the birthday celebrant prefers Transformer so Transformer it is! The giveaways will be in Transformer design. Hello, Optimus Prime and Bumble Bee. See you on February 15. 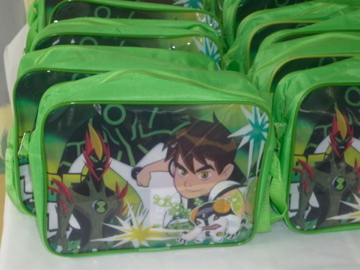 Last year, the giveaways were pouches with crayons, pencils, and other stuff and we only celebrated in their school classroom and in the warehouse for our friends and relatives. I cant find any photos as I just reformat my lappy and transfered all old photos either in USB or in the external hard drive. I cant remember the giveaways for his 2nd and 1st birthday party. Hi Miss.. thank u so much for adding me.. added you too.. ang cute nga mga kids mo.. mine are grown up na..God Bless dear! Hi sis! Those are pretty nifty giveaways you have there. Party supplier ka ba or coordinator? Hi .. thank u so much for adding me.. added you too..
^^ thanks for dropping by mommy vernz..
hi can you provide some tinkerbell pillow with a print picture on it with the celebrant? 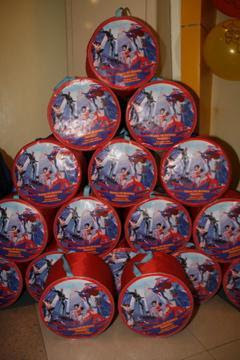 hi, can you provide a tinkerbell pillow with a picture print of the celebrant?